When Kansas soldiers returned from World War II, they often married and had children. This population boom resulted in a housing shortage that spanned across the nation. One entrepreneur addressed the need by retooling his wartime innovation into prefabricated housing. Carl Strandlund was a Swedish immigrant who had developed an interlocking, porcelain-enameled steel panel for a Chicago defense contractor. He adapted the production into affordable housing that was quick to assemble, durable, and essentially maintenance free. He received a federal loan in 1947 and established the Lustron Corporation, meaning “luster on steel,” in Ohio. Lustrons met the needs of the post-World War II families; 2,500 were built in 35 states across the nation. 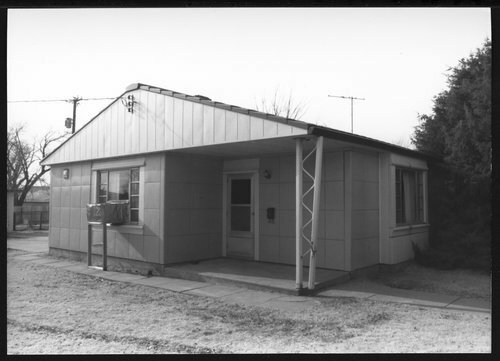 Eight Kansas Lustron dealerships were established and 100 houses were built. Clusters of these homes survive today in Larned, Garden City, Great Bend, Hays, and Russell. Models were priced from $8,500 and $10,000 with four different models: two or three bedrooms in a standard or deluxe edition. The deluxe models had more built-in features like a china cabinet in the dining room, book shelves in the living room, and a vanity mirror in the master bedroom. A choice of four colors was available: Dove Gray, Desert Tan, Maize Yellow, and Surf Blue with complimentary trim and roof colors. The interior colors were neutral, soft gray throughout except for the kitchen and bathroom, which were yellow. The walls and ceiling were made of enameled steel panels; composition tiles covered the floor.